Cream butter and sugar. Add flour a half cup at a time. Press into ungreased tart pan and bake for 25 minutes. Remove and allow to cool on wire rack. Whip heavy cream, gradually increasing your speed until 10/max and peak forms. Beat in powdered sugar and lemon juice at medium speed, one tablespoon at a time. Add mixture to cooled crust. 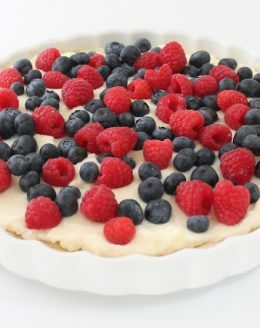 Top with seasonal berries or fruits of your choice.